AMG!!! How pretty, right? My husband just so happens to read every single blog post, however boring or un-relatable they may be to him. He read THIS ONE about my desire to own this polish back in February and held on to the info until April. Then he wandered into Dillard's and purchased it. He deserves lots of bonus points for that! 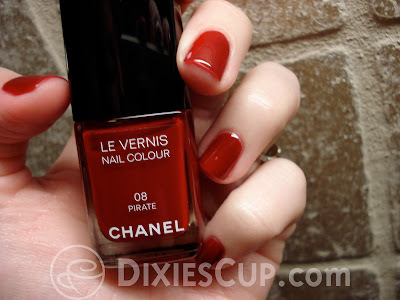 Chanel - Pirate is a lovely deep red jelly. It wasn't necessarily the easiest formula to apply, but it wasn't horrible. The first coat was a bit tricky, but after applying a second coat, things smoothed out just fine. The top coat made everything look flawless. I'm so happy I finally own this polish. I feel fancy when I tell people, "Yeahhh... it's Chanel." 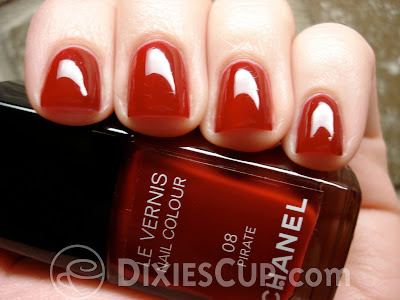 EDIT: Chanel polishes are available at your local Dillard's. Most retail for $26, which is what this particular polish cost. A friend asked if I thought the polish justified the price tag. My answer is no. I think it is lovely, but I doubt I'd ever go purchase this polish on my own. I'd rather find a cheap duplicate. However, it made a FANTASTIC gift! Just a reminder: all photos are clickable to enlarge. And just in case you DO happen to enlarge them, you might notice some small scratches on the surface of my nails. This is because I painted my nails and had to rush out of the house before I could snap any pictures. NOT because the polish is lame. Because it's not. For real. By the time I got home that evening, they still looked okay, just a little scratched. I should have put on another quick layer of top coat, but I didn't think of that until it was too late. Bummer. Thanks guys. Much love. Peace. your finger nails sure are purrrdy. i think we should have a girls night so you can teach us how to do this! We certainly could! It isn't very difficult, just takes practice.